The Heuer Monaco is a rare iconic watch. But this remarkable example of the reference 1133B manages to stand out even more. The original Heuer sticker on the case back and the mint condition (NOS) make this Monaco the ultimate collector's watch. Between 1969 and 1974, a maximum of 4,500 examples of the Heuer Monaco have been produced. Of course, after more than 40 years, much less Monaco’s have survived. Further there is only a very small amount in a mint NOS-condition - as with this particular watch. 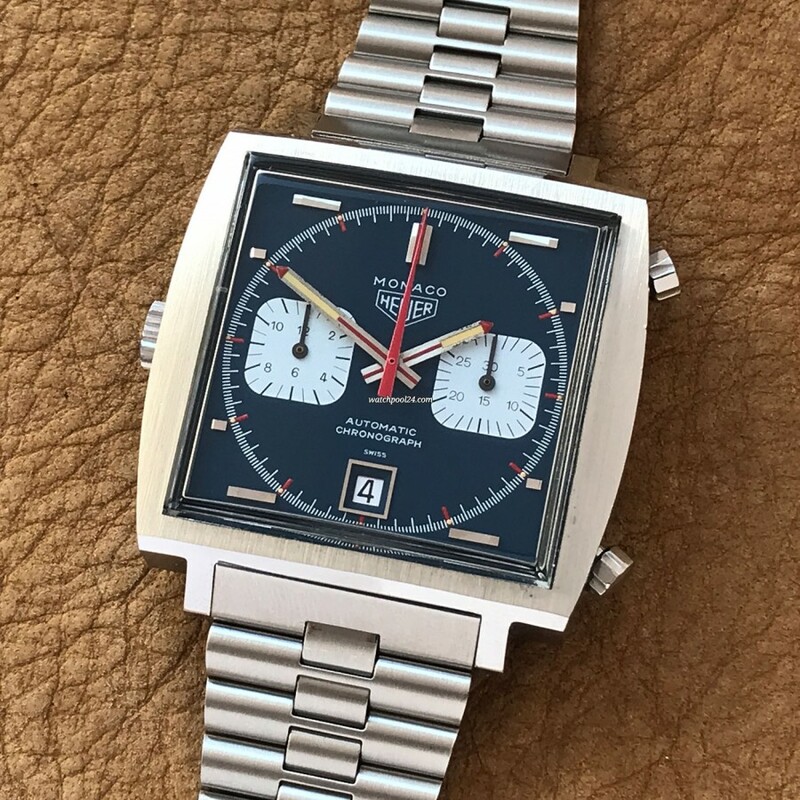 In addition, the Monaco offered here has the original Heuer sticker on the case back, which is considered an absolute premium for Heuer collectors. The extreme rarity of this particular Heuer Monaco is obvious. The stainless-steel case of this Monaco is unpolished and has no signs of usage. The blue dial is absolutely flawless. The original luminous material is completely intact. The beautiful, creamy color in hands matches the color in the hour markers. Every single tritium dot exists and has its original shape. The harmonious selection of the colors on the dial (blue, white, red, silver) is just awesome. At this point we would like to refer to our pictures, because a picture is worth a thousand words. This Monaco is fitted with the caliber 12 of Heuer. This movement is the improved successor version of the legendary caliber 11. The watch comes with the original bracelet made by Novavit S.A. (NSA). This is a MK2 version of the bracelet and fits exactly the time period of the watch. The Heuer logo is attached to the clasp. If you want to own THE ONE Monaco, this watch is for you. It will definitely be one of the highlights in every watch collection.